Off the Beaten Path: Has Life Knocked You Down? Sometimes life knocks us down...knocks the air out of our lungs and the wind out of our sails. But we can get back up. Hope gets us back up. God is gracious to fill us with hope that fortifies us, steadies us, strengthens our resolve. Hope fills our lungs with peace and our sails with joy. Hope brightens the future by shining a light at the end of the tunnel. It assures us that life is worth living and God is good...and always enough. Now may the God of all hope fill you with joy and peace as you trust in Him, so that you may overflow with hope by the power of the Holy Spirit. But we can't just stand there...filled with hope. We require faith to move forward. Hope gets us up on our feet, but faith gets our feet walking forward. We walk forward...through the fire, through the storm, over the mountains, during the famine, through the pain...because we have faith. Faith in what? Oh, that matters. A faith that moves us forward...consistently, fearlessly, with determination...is not a misplaced faith. We miss the point if we place our faith in the goodness of humanity, the fairytale ending, the promise of things getting better. that He is working all things together for good. that He always keeps His promises. Faith in God alone will move us forward when the circumstances of life have stopped us in our tracks. But life isn't just about walking forward. Life calls for us to engage. If we just walk forward, but don't engage, we don't really live. Instead, we isolate. Hope gets us on our feet. Faith moves our feet. But love keeps us engaged. Love enables us to reach out and grab a hand for support...reach out and give...reach out and serve...reach out and forgive...reach out and embrace...reach out and share. Love allows us to walk hand in hand and heart to heart with others who struggle, but also hope and believe. 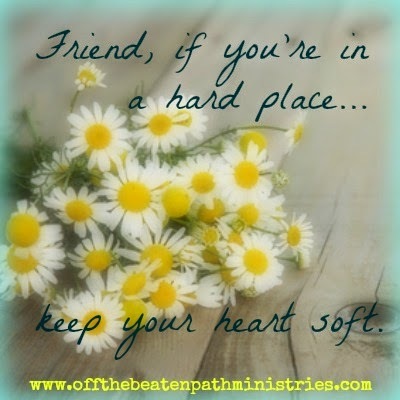 And that, dear friend, is why it's important to keep a soft heart...even in life's hardest places. Which do you struggle with the most? 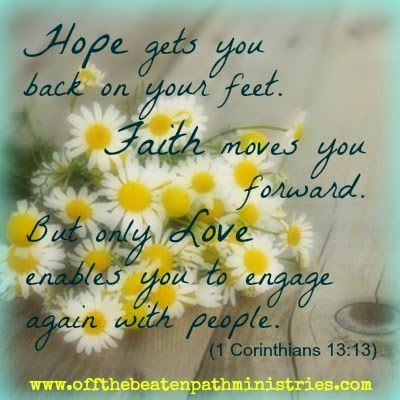 Having hope, faith or love in a tough season of life? I'd love to pray for you. Please let me know how I can pray for and encourage you in your difficult season.